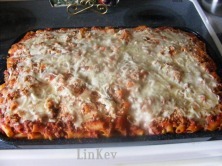 Mom used to make this pasta on special days, like on Holidays and a lot of Sundays. It was a big treat for us. It's a lot of work because of all the ingredients that you have to prepare and layer but it's well worth it. and mom's sauce recipe follows on bottom. 1 Make sauce first directions on bottom. Brown ground beef and drain fat, boil eggs (hard boiled) cut eggs in slices, discard the ends of the eggs, cook pasta as directed make it a little al dente. Drain pasta and put it back in the pot, mix ground beef, pour enough sauce to coat the pasta make sure you divide the sauce so you can have enough for the baking preparation. Mix the ricotta with the 2 tablespoons of water so it can be easy to spread on the pasta. 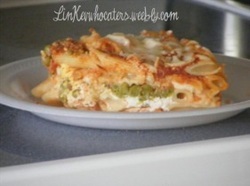 sprinkle half of the grated cheese and layer the eggs on every section of the pasta, sprinkle half of mozzarella. Add the remaining of the pasta and add grated cheese, sauce and mozzarella .